...is now available. I'll be signing shiny new copies of the book with author Deborah Blumenthal Wednesday, August 18th from 10:30 - 11:30 at the Clinton Book Shop, 12 East Main Street, Clinton, NJ. Blumenthal’s dog-and-boy story may be too sad for some, but her lyrical prose and Gustavson’s (Mind Your Manners, Alice Roosevelt!) lush paintings have the impact of a documentary film. 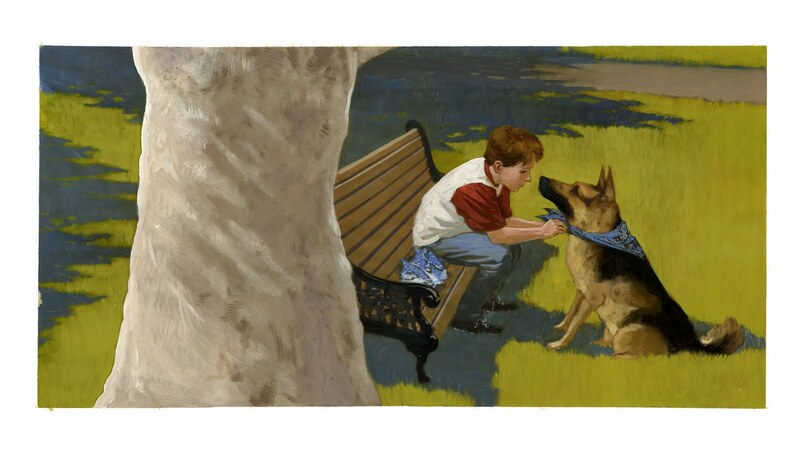 The Blue House Dog, a stray German shepherd mix, has been left homeless after his owner dies, while the death of the boy narrator’s old dog has left him bereft. Blumenthal (Charlie Hits It Big) observes the boy as he works to approach and tame the stray, paying close attention to physical sensations (“He lets me run my hand/ lightly over his fur./ It’s the same color as my hair”) and crafting affecting prose-poetic lines (“he scrunched down/ under a building,/ waiting like a soldier/ hiding from the enemy”). 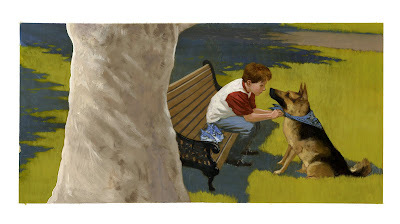 Gustavson’s paintings capture the big dog’s skittishness and the boy’s protective instincts. Scenes of autumn leaves and spring flowers reinforce the sense that the intimacy between the two takes months to develop. The emotions are raw and authentic, while the way in which they’re delivered is elegant--a potent combination. Ages 4-8.